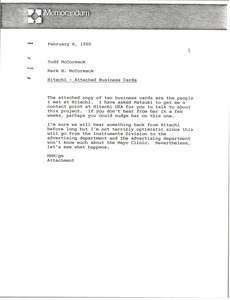 Concerning the attached photocopy of a business card for G. Michael Gougler of GGS. 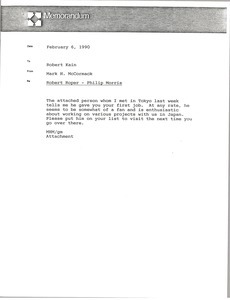 Concerning the attached photocopy of a business card for Robert Roper of Philip Morris. Concerning the attached photocopy of business cards for Takashi Fujisawa of the Ski Association of Japan. Concerning the attached business card of Ten Venner, a man from Latvia who is interested in working with IMG on their Riga project. 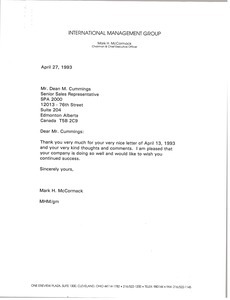 McCormack is pleased that Cummings' company is doing well and wishes him continued success. 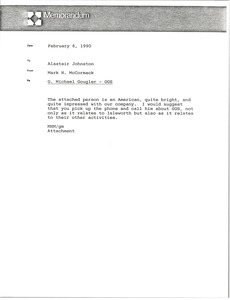 McCormack is responding to the attached letter from Cummings, also enclosed is Cummings' business card, and a clipping from the Edmontin Sun of September 2, 1991, entitled "Clan joins forces." 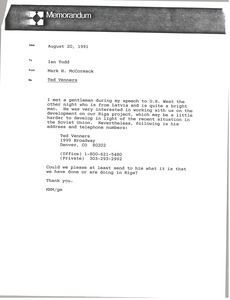 Clipping not digitized. 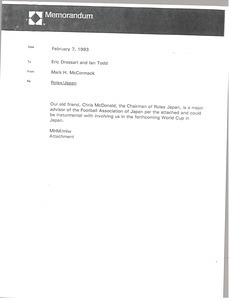 McCormack writes that "our old frield" Chris McDonald, the Chairman of Rolex Japan, ia a major advisor of the Football Association of Japan, and wonders if he could help IMG involvement in the World Cup in Japan. 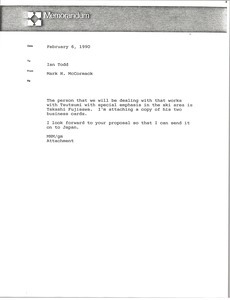 A photocopy of McDonald's business card is attached. 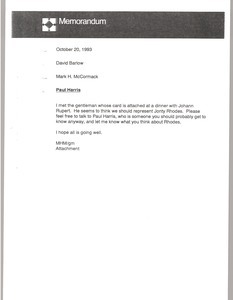 Concerning the attached business card of Paul Harris, McCormack asks Barlow to contact Harris, who thinks IMG should represent Jonty Rhodes. 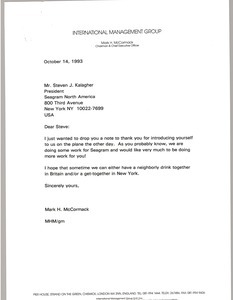 McCormack thanks Kalagher for introducing himself on the plane the other day, and writes that IMG hopes to do more work with Seagram in the future. Attached is a photocopy of Kalagher's business card. 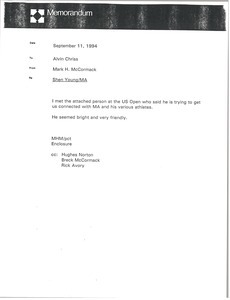 Concerning the attached business card of Shen Young, who is trying to get IMG connected with MA and his various athletes.